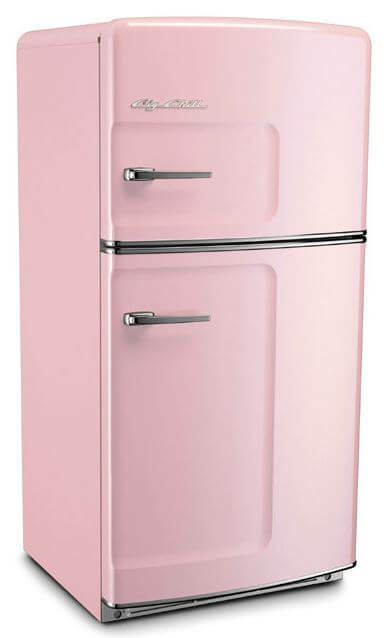 #1 — Big Chill’s classic retro refrigerator comes in two sizes, a 20.9 cu.ft. unit and a 14.4 cu.ft. unit. 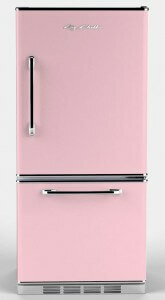 They also have an undercounter fridge that you can get in their complete color palette, including pink. 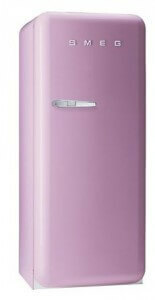 Link: Big Chill refrigerators. 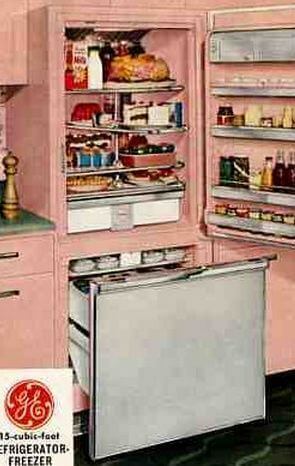 #2 — Big Chill’s Retropolitan refrigerator has more of a Jetson’s look and the freezer on the bottom. 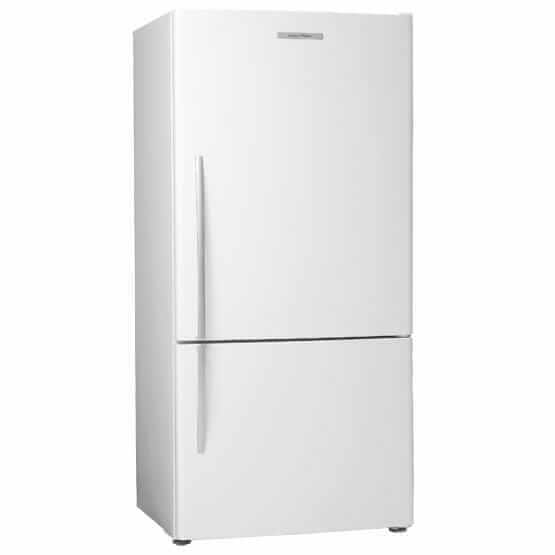 It is 18.5 cu.ft in size– and it is 2″ less deep so sticks out less. Link: Big Chill refrigerators. 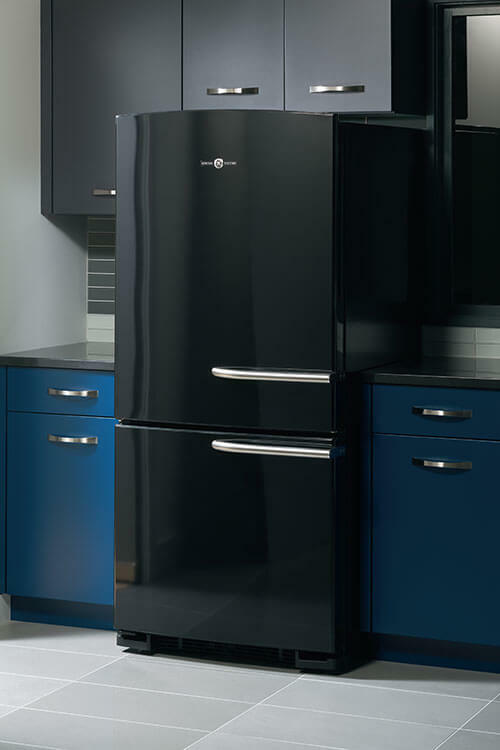 #3 — The Northstar refrigerator by Elmira Stove Works comes in three sizes and variations: The 19 cu.ft. model has the freezer on the bottom, while the freezer is on the top in 18.2 cu.ft. and 11 cu.ft. models. You can also get the 11 cu.ft. model with a built-in kegger. 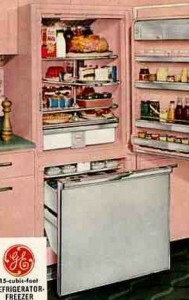 Link: Northstar refrigerators. 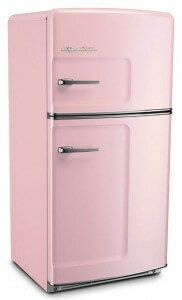 #4 — The Smeg ’tis a baby doll, coming in at just 9.2 cu.ft., but she is oh so cute. Remember Laura’s? 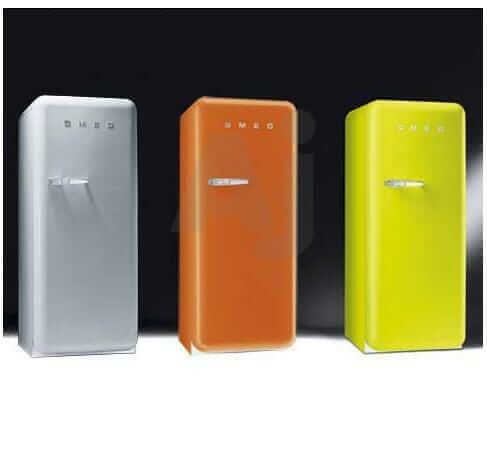 Link: Smeg refrigerators. 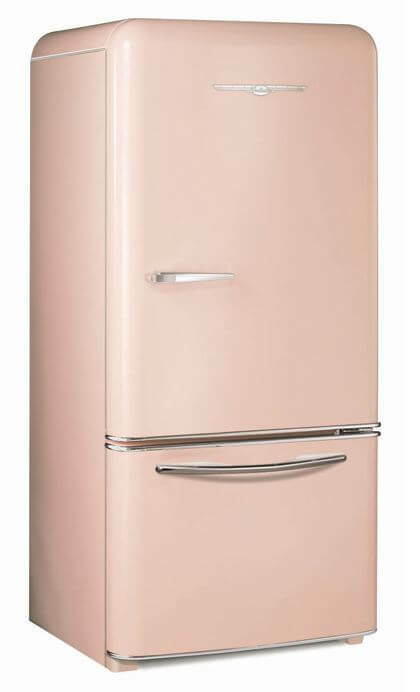 #5 — Take your plain-Jane refrigerator to an auto body shop or industrial painting place — Professional painting joints can consult online paint color guides to match or help get you the color you want. The advantages of professional painting include (1) they have access to very durable automotive paints, (2) they use dust-free booths to avoid itsy bitsies ruining your smooth glossy finish, and (3) someone else does it. However, you will have to get your fridge there and back, and this will cost you, of course. 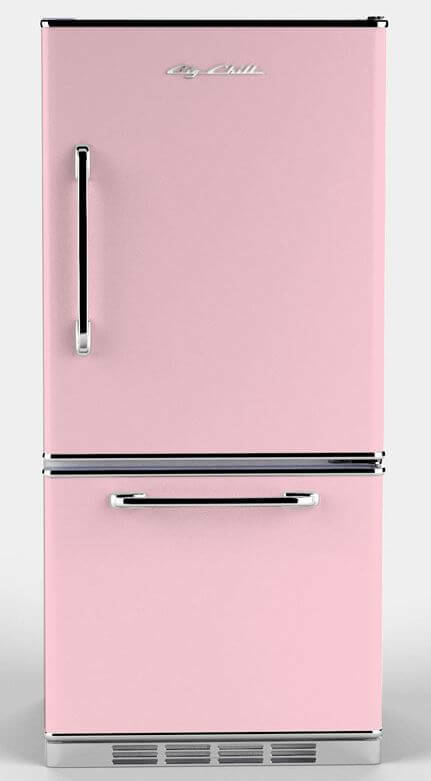 #7 — Stalk craigslist and Re-Stores for a vintage pink refrigerator. This will take time. But once you send your vibes out into the universe, the Retro Decorating Gods may reward you sooner than you think. I am not an expert on what to look for in a vintage fridge. See this post for some links and such if you are serious about pursuing this option. 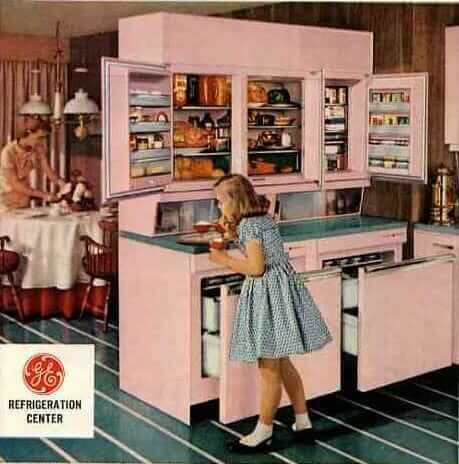 Update March 2019: I did a lot of new research on where to buy a retro refrigerator — I have seven ideas — see them all here. 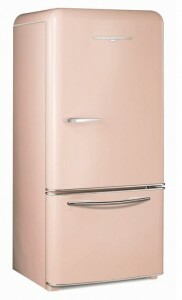 I have a Northstar vintage style fridge which I love – it actually makes me smile when i open it up. How many people can say that about a fridge? I got white (altho entertained getting a color) which totally compliments my vintage O’Keefe and Merritt vintage stove that has been reconditioned. Nothing better than some vintage love in the kitchen! I am thinking my poor beat-up Kenmore side-by-side in my Texas house wouldn’t look too bad done in RustOleum Warm Yellow Painter’s Touch. The white has got some scratches on it from too many moves and rough treatment by the kids when they were little. I’ll see if my sister wants to help me add a bit of early ’60’s fun to a 1990’s refrigerator. A little piece of me died inside when I was at the Catholic Charities and spied a vintage harvest gold fridge, with wood handles (forget the make) going for $50, with a ‘sold’ sign on it. Dated 7 weeks out (like they had to put off picking it up). There again Mr. Wonderful would have issues with the debate of cost to run. I’d REALLY like to get some data on what the difference really is, especially when you consider how well things were made back then and how they last. Side note: When Mom and Dad split in 1977, Mom got her own place and bought a Sears Kenmore apartment dryer (harvest gold! ), which I got from her when she purchased a set. That thing just gave up the ghost about a year ago and ONLY due to a worn out belt which couldn’t be replaced due to the fact Kenmore no longer made that specific part. Believe me, I searched for something that would work. Great topic Pam, and lovely fridges! Hannah: I have a 1963 Lady Kenmore dryer that I can still find the belts for. I’m sure you could find the belts for you 1977. If you still have the machine and want to still replace the belt I know of a couple places that probably would have it. One place is a local appliance parts place that I have gotten parts for my dryer and the matching washer. Also the other is a friend of mine who owns an applaince repair shop in the D.C. area. He works on the vintage machines as well and has a surplus of parts. He would definately have it. One of the selling points for this fridge was how little electricity it needed and how long it would last. I’d say the advertising people weren’t lying for once! In our experience painting works quite well. Hubby painted the dishwasher and a breadbox pink for me and it really made the kitchen. Dishwasher is easy – just remove the front panel, clean, spray, cure, etc until it’s ready to reinstall. Beautiful. Whirlpool Sunset Bronze kitchen appliances: Would you?